Held during the third full week of every October, National School Bus Safety Week celebrates school buses and school bus safety. Promoted by the National Association for Pupil Transportation (NAPT), this year’s theme for October 22-26 is “My Driver — My Safety Hero!” This week, school districts across the country are involving students, parents, teachers, car drivers, school but drivers, and school administrators in discussions about the importance of school bus drivers in students’ lives. After all, this is often a student’s first and last school interaction of the day. Participate in the annual poster contest. NAPT holds a yearly contest that prompts students at all grade levels to illustrate safety at their school and around the school bus. In fact, each year’s theme relates to the poster contest the year before. The 2017 winner, drawn by Aumkar Patel, a fifth grader at Henry County Schools in McDonough, Georgia, depicts a bus driver as a superhero with a cape, holding the school bus over his head. Floating in outer space between the sun, earth, and Jupiter, the words “My Driver — My Safety Hero!” and “Safety First!” ring out across the sky. Discuss what this year’s theme means to you. What are your opinions and reactions to the NAPT’s chosen theme for 2018? How can you and others talk to students about interacting with their school bus drivers on a daily basis? Are you familiar with a school bus driver’s duties, training, and safety precautions, or do you need to learn more about what they do to protect students? These conversations will be helpful in focusing on particular aspects of safety and how to communicate with and stay involved with our valuable school bus drivers. Review safety tips that you can use year-round. NAPT has a great list of list of safety tips that it sends to schools, administrators, and parents during National School Bus Safety Week each year to remind everyone to be safe. The list highlights ways to stay safe while getting ready for school, walking to the bus stop, waiting at the bus stop, getting on and off the bus, and using mobile devices on the bus. As a reminder, mobile devices are often permitted as long as students can use the handrails to board and depart the bus, the sound is muted or headphones are used, content doesn’t violate school policy, and the device doesn’t create a distraction for the school bus driver. Promote this week on social media. The main hashtag for this week is #NSBSW, an acronym for National School Bus Safety Week. Use this easy-to-remember hashtag on Facebook, Twitter, and Instagram to post your pictures and conversations about school bus safety this week! Take a selfie with your school bus driver, pose next to your school bus, or tag your poster contest entry to celebrate. 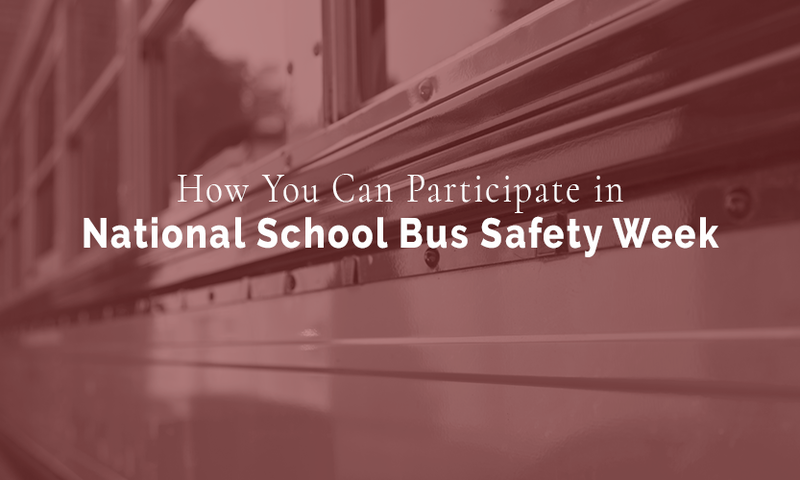 Whether you’re creating a poster for the annual contest or would like to learn about more aspects of school bus safety, it could be fun to know about the upcoming themes for National School Bus Safety Week. In 2019, the theme will be “My School Bus, The Safest Form of Student Transportation!” followed by “Red Lights Mean STOP!” in 2020 and “Can’t Touch This — The Danger Zone!” in 2021.